The Shredder gleefully claims that Krang will have to believe him about destroying the Turtles now that he has a collection of shrunken buildings. April and Splinter get stuck in New York City traffic on their way to get the Eye fragment from Shredder. The Turtles are enjoying being shrunk because they can get more than enough pizza… just as a sewer trickle flushes them down the pipes. The lads are attacked by a snake, but Leo saves the day. Krang tells Saki that he doesn’t care about shrunken buildings, he wants the Turtles! Baxter reveals a device that will help them find the tiny TMNT, so Shredder sends Stockman out alone to bring the Green Team to him. The Turtles end up being flushed out into the harbor, where Baxter is waiting to capture them with a fish net. The mad scientist sticks the TMNT into a jar and returns them to Shredder. April and Splinter are finally free of the traffic, and they park the van and prepare to enter Shredder’s hideout. Shredder shows Krang that he has the TMNT in hand, and prepares to crush them with a crowbar… much to the Warlord’s delight. But before the evil ninja can deliver the killing blow, Splinter bolts into the room and engages Saki in combat. April finds the Eye fragment and uses it to return the Turtles to their normal size… but the battle between Splinter and Shredder isn’t going well for the old rat! 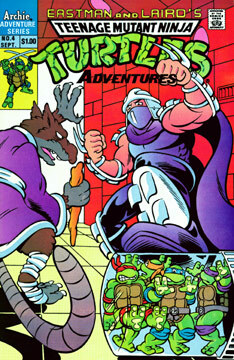 Just as Saki prepares to murder Splinter, the Turtles save the day! In the confusion, the Eye fragment finds its way into Baxter’s hands, who tosses it to Shredder. The two villains make their escape, with the crystal piece still in their possession. The Turtles return home and watch April on the news, and then have their customary dinner… albeit a small bit altered.